Did somebody say Mint Fudge?! Okay, okay...we've already established that I'm not a food blogger here (but maybe I should become one?!) but it would almost be cruel not to share my new favorite Spring treat. Not only does March bring you green grass, a green river (St. Patrick's Day of course), but for two more weeks it also brings you mint fudge gelato! I can honestly say that I usually go to Siena Tavern for the coccoli -crispy dough, cheese, prosciutto, and truffled honey - but the past couple of times I have found myself making frequent trips for their gelato. With their scrumptious staples that are always available - such as salted caramel & pistachio - as well as their surprise flavor each month, it's definitely a "Treat Yoself" type of adventure. This month (and only for 2 more weeks!) patrons can enjoy mint fudge (pictured below) which is made with a mint base and includes fresh mint, creme de menthe, and fudge swirls. 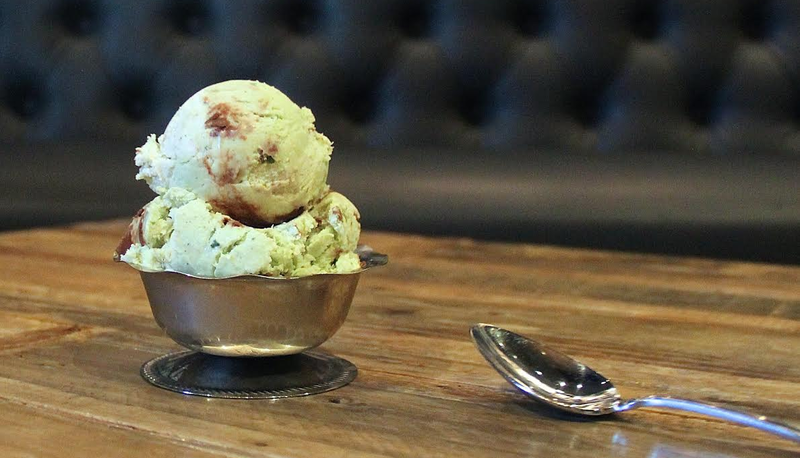 Don't be green with envy this March, be green with gelato! If you didn't know, now you do. Not only is the first Winter Music Festival, Snowstorm, coming to Navy Pier this weekend, but so is the BIGGEST white out party this city has ever seen! Here are my top picks - whether you're ready to rock, want to make sure to stay warm (even though this is indoors), or just want to make sure you're comfortable all day - these essentials should do the trick. Also, if you want to ensure that you make it up to the front row for one of the best seats in the house, make sure you're in head-to-toe white (no graphics allowed on your tee) and make sure to get there early! Some ticket + experience packages are already sold out, so make sure to snag yours fast and join me at the fest. See you all on Saturday!